Is it true that County homes sell for less during winter? Or is that just an unfounded rumor? The selling to listing price ratio is a real estate metric which compares the selling prices of homes to their listing prices. Another way to approach it is to think of the selling to listing price ratio as the discount that buyers are getting off listing price. 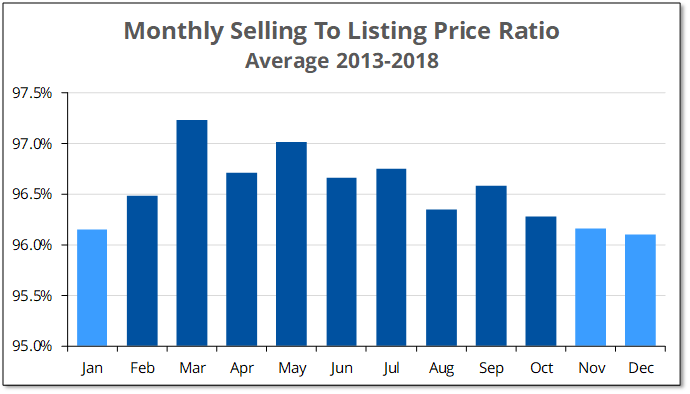 When the average selling to listing price ratio is calculated by month over the last five years, a clear picture emerges. And, it turns out, it’s true that County homes sell for less during winter. Savings, however, is not night and day. The extra “discount” on homes sold during the winter months is about 1% compared to the most expensive month of March. To put things in perspective, this means a buyer of a $500,000 home will save in the neighborhood of $5,000 buying between November and January.